I had great pleasure in reading your friendly letter three weeks ago, when I returned from a long stay on the West Coast. Why, my good friend, your memory has dropped a stitch! You ask me whether A Chance Meeting3 was ever republished. It was republished in a slim volume called "Not Under Forty"4- - -and you yourself wrote a most charming and friendly review5 of that volume for The Atlantic Monthly6! I do not keep many reviews of my books, but that one is filed among those I did keep. You had more knowledge of the atmosphere of Mrs. Fields'7 house than many people who have written extensively about those old Boston8 days. 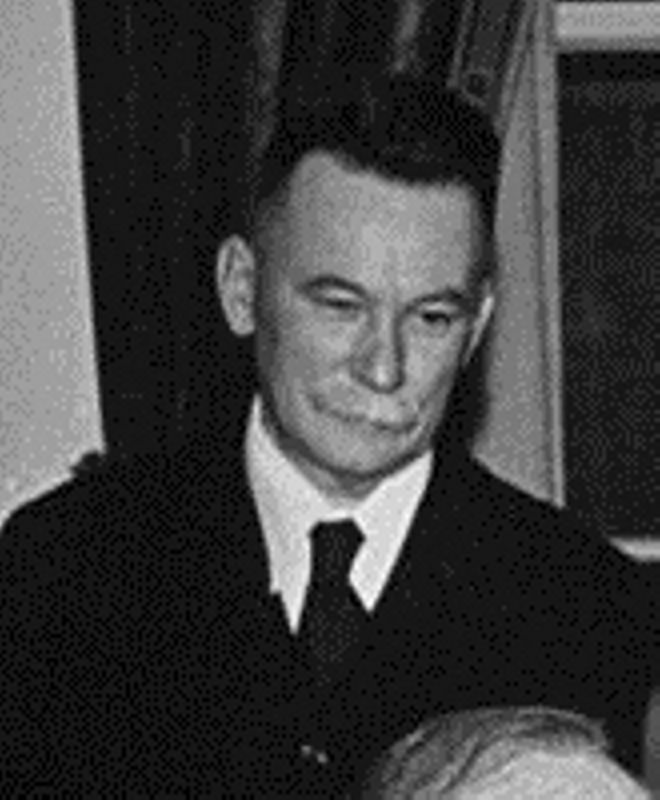 Mr. Van Wyck Brooks9, for example, usually a most punctilious writer, in his book10 on autumnal New England11 credits me with editing a volume of Mrs. Whitman's12 letters. Mrs. Whitman died some years before I first went to Boston, and it was dear Miss Jewett13 who edited Mrs. Whitman's letters. No, I am not familiar with the story about Flaubert's14 messy dressing room which you attribute to Henry James15. 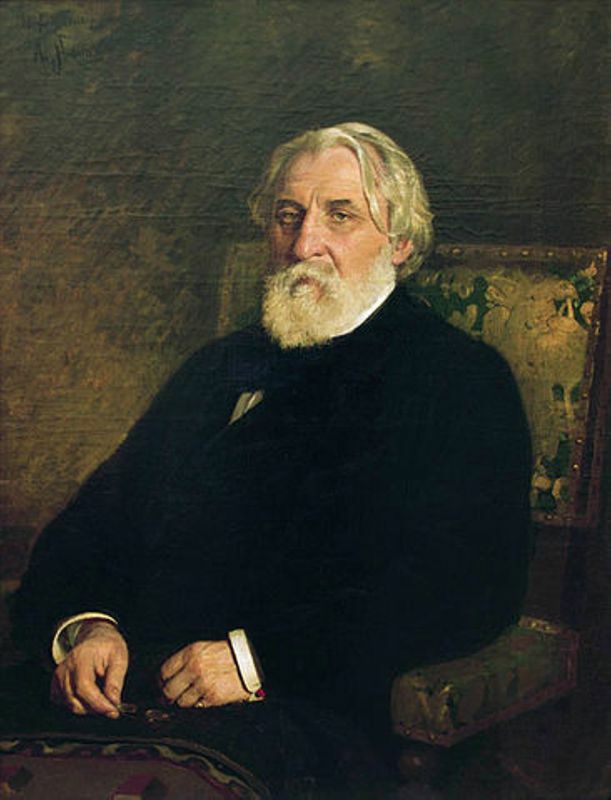 But I do remember that somewhere James admits that he sent both Flaubert and Turgenev16 each of his books from time to time as they appeared, and that the gentlemen never acknowledged them. Very sporting of Mr. James to admit it, wasn't it? Sedgwick, Ellery (1872-1960). American magazine editor. Born in New York City to parents from a distinguished New England family, Ellery Sedgwick graduated from Harvard University in 1894. He was assistant editor of the Youth’s Companion (1896-1899) and then editor of Frank Leslie’s Popular Monthly (1900-1906—renamed Leslie’s Monthly then American Illustrated Magazine). 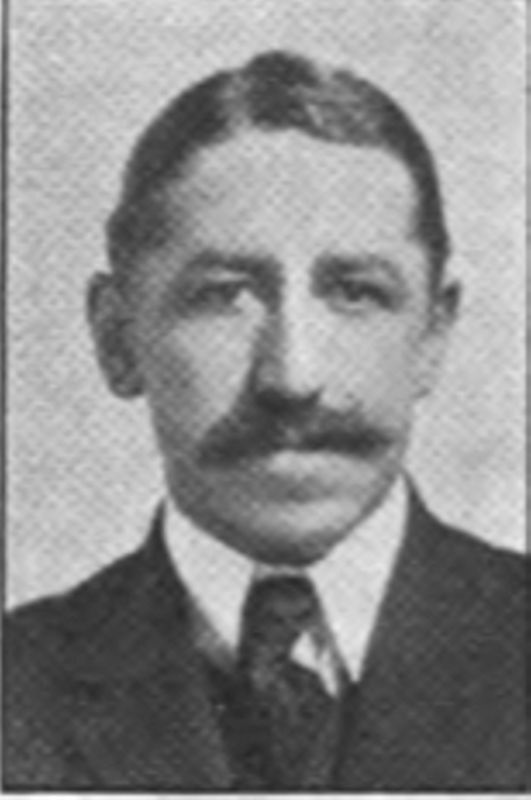 He worked from 1906 to 1907 at McClure’s Magazine and briefly as a book editor at D. Appleton and Company; in 1909 he began his long run as editor of the Atlantic Monthly, which he had bought in 1908. Cather evidently first met Sedgwick when they both worked at McClure’s, although she may also have encountered him at the home of Annie Adams Fields in Boston. 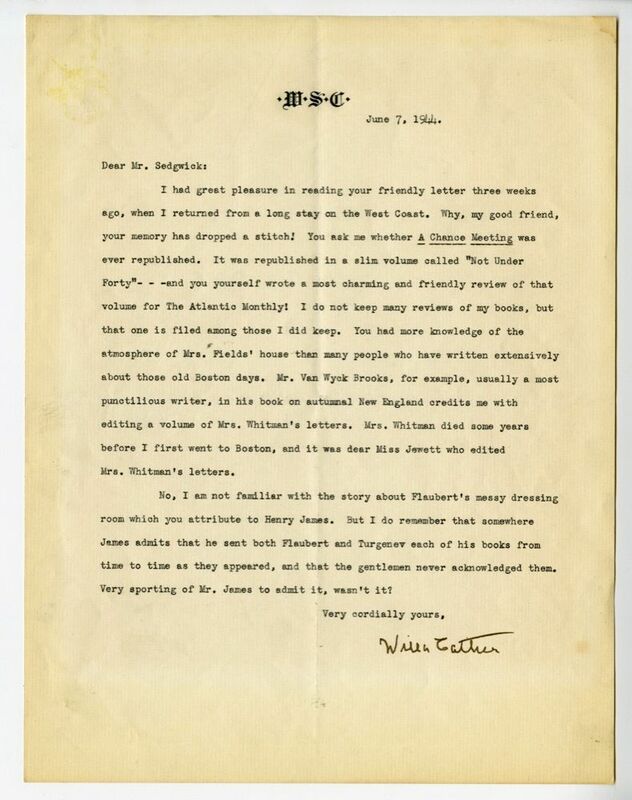 When Sedgwick wrote to Cather soliciting a review of Memories of a Hostess: A Chronicle of Eminent Friendships, Drawn Chiefly from the Diaries of Mrs. James Fields (1922, edited by M.A. DeWolfe Howe), she identified the Atlantic as “the only American magazine I read” (#3021). She also published the poem “Poor Marty” (1931) and the essay “A Chance Meeting” (1933) in the Atlantic. Sedgwick’s wife Mabel, whom he married in 1904, died in 1937. He sold the Atlantic in 1939, the same year he married Marjorie Russell. He died in Washington, DC. Brooks, Van Wyck (1886-1963). American literary critic and cultural historian. Born in Plainfield, NJ, and educated at Harvard University, Brooks was a prolific author of books on American literature and culture, focusing especially on the legacies of Puritanism and on nineteenth-century American literature. The Flowering of New England, 1815-1865 (1936) was awarded the Pulitzer Prize in history in 1937. Followed by New England: Indian Summer, 1865-1915 (1940) and three additional volumes about American literature through the early twentieth century, the five volumes were collected as Makers and Finders: A History of the Writer in America, 1800-1915 (1952). In 1940 Brooks wrote Cather about Archibald MacLeish’s book The Irresponsibles (1940), and she agreed with his assessment of it. Shortly thereafter, she wrote to correct his assertion in Indian Summer that she had edited the letters of Sarah Wyman Whitman. It is not clear whether their acquaintance went beyond this brief correspondence. Whitman, Sarah Wyman (1842-1904). American painter and designer. 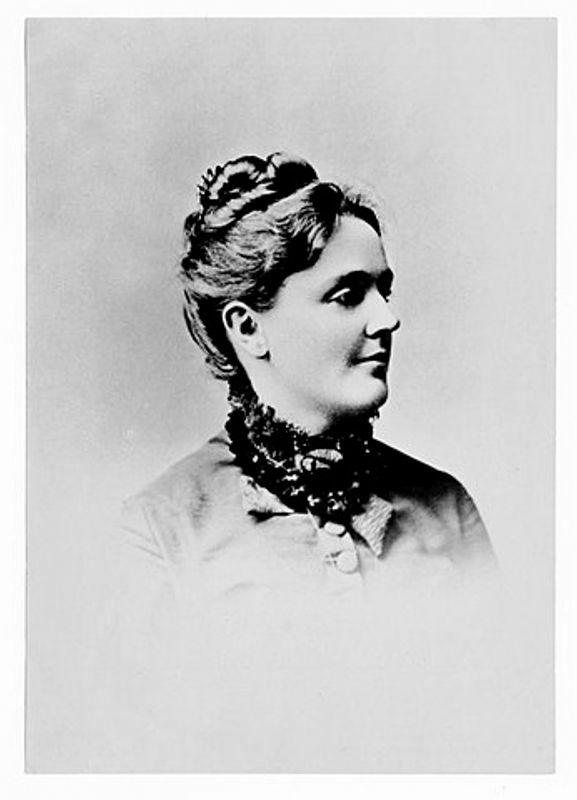 Born in Lowell, MA, Sarah de St. Prix Wyman married Henry Whitman in 1866. 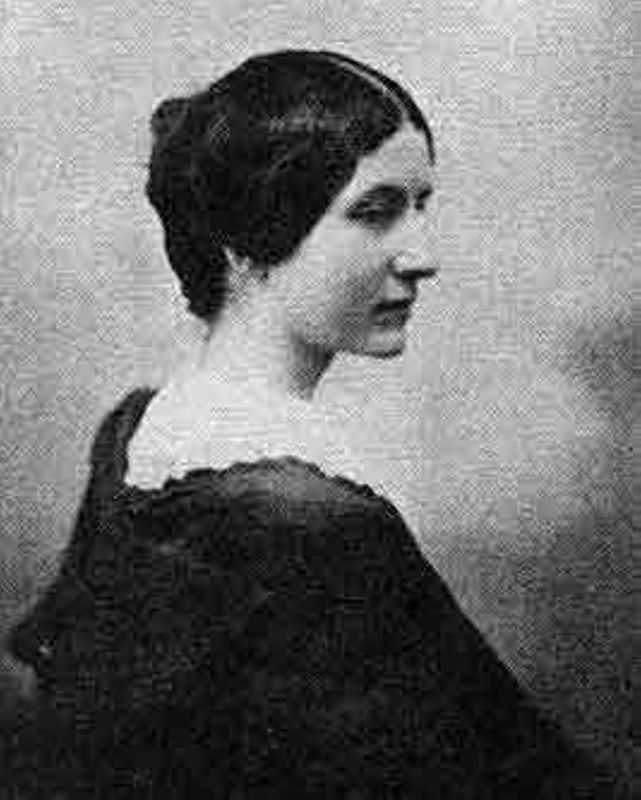 Whitman began her short artistic training with William Morris Hunt in Boston, MA in 1868 before studying with Thomas Couture in Paris, France. By the 1880s Whitman was successful in the Boston area as a painter and stained glass artist and was a leading figure in Boston’s Arts and Crafts movement. Employed as the in-house designer for Houghton Mifflin and Company, she designed book covers for works by Sarah Orne Jewett, Celia Thaxter, Oliver Wendell Holmes, and others, pioneering in the design of modern cloth book covers. Cather was bemused when in his New England: Indian Summer (1940) Van Wyck Brooks credited her with editing Whitman’s letters for publication because Cather never met Whitman. She did, however, remember hearing stories from Jewett and Annie Fields, Whitman’s “devoted friends in Boston,” about her “sympathetic intelligence and charming personality” (#1499). 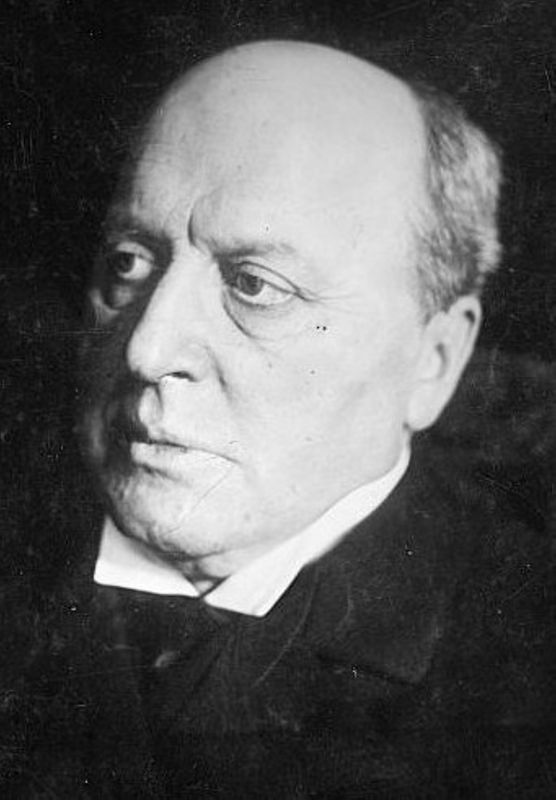 Flaubert, Gustave (1821-1880). French novelist. Born in Rouen, France, son and grandson of physicians and surgeons, Gustave Flaubert began writing at an early age. He traveled extensively in Europe and the Middle East but lived primarily in Rouen with his mother and orphaned niece, Caroline Flaubert. Flaubert was devoted to his craft, taking five years to write Madame Bovary (1856) and seven to write L’Education sentimentale (1869). His precision in observation as well as in style established modern literary realism. Even his historical novels, such as Salammbó (1864), set in ancient Carthage, reflect his meticulous attention to every detail. Willa Cather read Flaubert’s works from her youth.